Inflationary pressures have been on the rise since 2016. The U.S. Inflation Rate currently sits at 2.20 percent up from 1 percent in early 2016. Increasing economic growth both globally and domestically have aided the rise of inflationary pressures. The rise or fall in commodity prices are a good reliable gauge on inflation. But the biggest driver of natural resource prices appears to be the U.S. dollar. The greenback's impact on commodities is not immediate but still well contacted to resources. 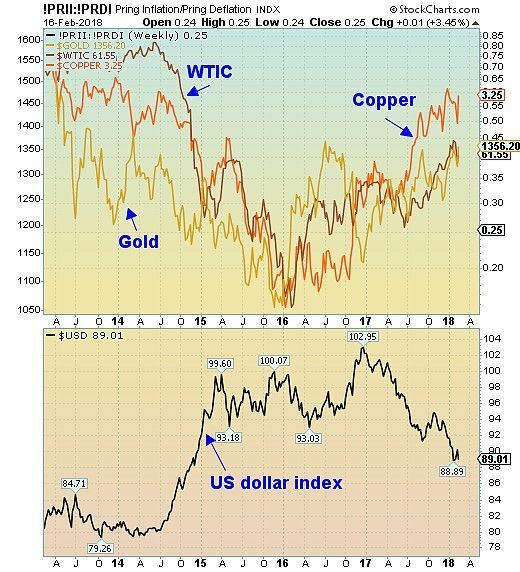 There are many reasons why the value of the dollar influences commodities prices. The primary reason is that the dollar is the benchmark pricing mechanism for most commodities because the U.S. currency is the reserve currency of the world. The dollar tends to be the most stable foreign exchange instrument so most other nations hold dollars as reserve assets. With increasing competition from other currencies, primarily the Euro, and the outlook of a continuation of a dysfunctional White House, the "Big dollar" appears set to hold to its downward trend. But a lower dollar is not all bad news, particularly if you like commodities. As the US$ started to fall in 2017, natural resource prices caught a tailwind and steadily rose. 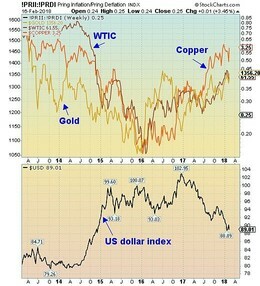 Bottom line: The recent decline of the U.S. dollar index has been to the benefit of most commodities. Yet the rise in natural resource prices is not without a darker side. Inflationary pressures, which are often linked to the increase in raw materials and a sagging dollar, are anticipated to advance. With the expected continuation of forces (competition from other currencies, dysfunction within the Trump White House) to play against the U.S. currency, the dollar should remain depressed, inflation should continue to rise and commodity prices are anticipated to see favourable pricing into mid-year. Projection models for the U.S. Inflation Rate suggest a rise to 2.50 - 3.00 percent by the end of this year.